We offer the highest level of compassionate quality care and use the latest in technology to obtain the best possible results. Our Board Certified Physicians are more than just vein specialists. We treat the entire range of peripheral vascular disorders. Sometimes there are underlying conditions that should be treated before treating the effected vein to minimize any complications and risks to the overall health of the patient. We provide comprehensive exams and advanced diagnostic studies to determine the full extent of the disease and provide the most advanced treatment options available. 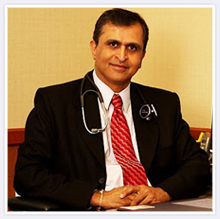 Dr. Doshi, MD, FACC, FSCAI, is a highly reputed physician with 4 medical board certifications. He has successfully performed thousands of cath based procedures. With his extensive education and experience, we are able to provide an unmatched level of skill and experience, giving you the confidence necessary in choosing a Physician. Founder of the Interventional Program at St. Alexius Medical Center. Published in Endovascular Today and other notable journals. Invited faculty for Vascular Conferences. Director of hands-on courses for Peripheral Vascular Intervention. Instrumental in the development and implementation of interventional vascular devices. We are totally committed to achieving the best possible outcomes and making our patients’ feel comfortable throughout the entire treatment process. Want to find out further information about our non-surgical vein treatment? Simply call us at 847-605-9500 today and our knowledgeable representative will schedule you for the next available consultation. If you prefer to use our website to schedule a consultation, please click here. Nice Vein Clinic with a great staff. Very neat and clean. Courteous Staff. But the best part is the vein doctor himself - Dr. Doshi who's a well known cardiologist.